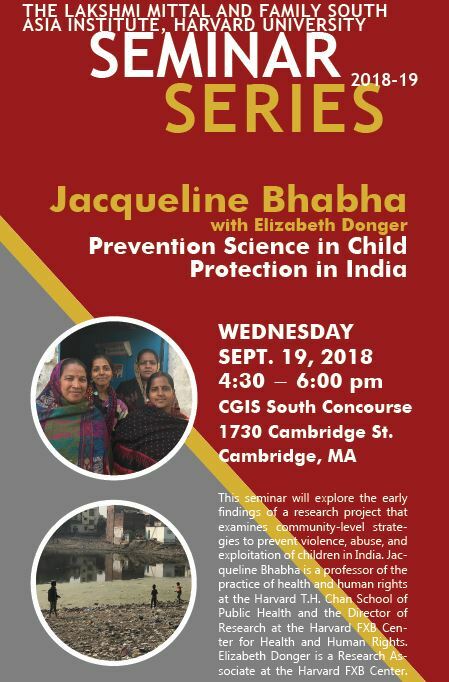 Join Jacqueline Bhabha and Elizabeth Donger for a discussion about prevention science in child protection, with a focus on India. This seminar, with support from the Harvard University Asia Center, will explore the early findings of a research project that examines community-level strategies to prevent violence, abuse, and exploitation of children in India. The project involves three separate evaluations of harm prevention programs run by innovative Indian nonprofits in Uttar Pradesh, West Bengal and Telangana. The study is intended as a corrective to the dominant focus on remedies targeting already-occurred violations of children’s fundamental rights. It will enable further research in this field and will guide policy development. It aims to shift the focus of child protection inputs and outcomes to before harm occurs, rather than after harm is done. Jacqueline Bhabha is a professor of the practice of health and human rights at the Harvard T.H. Chan School of Public Health and the Director of Research at the Harvard FXB Center for Health and Human Rights. Elizabeth Donger is a Research Associate at the Harvard FXB Center. This event is co-sponsored by Harvard FXB and the Lakshmi Mittal and Family South Asia Institute.